Imagine a garden with Italian pavers, Italian terra-cotta pots, mortared walls, the sound of water, lush vegetation, and everything in bloom. You may be surprised that the garden being described is in a previous burn area in Oakland, California—not the lake regions of Italy. Twelve years ago, Sandra Fu Cleveland purchased her home in the area of Oakland where thousands of homes were destroyed by a fire in 1991. With a steep grade and small budget, Sandra set out to completely change her home's outdoor space, which still included burnt trees and a burnt fence. The home and garden now boasts a Mediterranean feel. The hardscapes were designed by Andreas Flache of AFLA Landscape Design, and the plant design was completed by Sandra, a landscape design student. 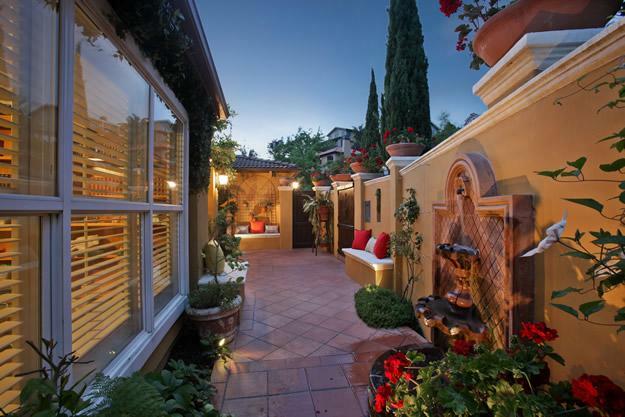 Twilight at the Gardens of Villa Giuseppe in the Oakland Hills area of Oakland, California Are you passionate about outdoor design and garden aesthetics? Garden Design magazine features ideas and well-researched insights from the work of the top designers and landscape architects, as well as material selections, furnishings, plant combinations, and outdoor style.